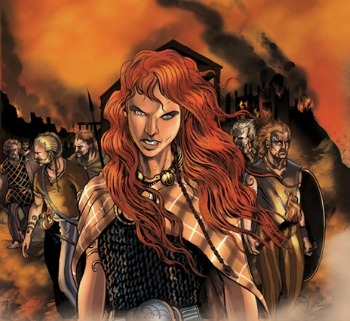 The story of Boudica is an amazing one. A woman who refused to be bullied, she stood up for herself, and took on the might of the Roman Empire. This poem for kids by British writers Jon Bratton and Paul Perro was written in 2009, and celebrates Boudica's heroic stand. If, after you have enjoyed the poem, you would like to know more about the warrior queen, please scroll down a little further for some interesting facts. The illustrations on this page are by Mike Rooth. Was tall and strong and loud. She had a mane of long red hair. You’d spot her in a crowd. A place where Norfolk is today. And paid them to stay away. All the king’s wealth and land. Who were angry at being cheated. The queen and her daughters mistreated. She had never been angrier. A place now called East Anglia. "We can't let them do this to us!" She said, "It isn’t right. And let’s give the Romans a fight!" And they attacked town after town. They burned their houses down. And the Romans were the winners. And the Britons, just beginners. The Battle of Watling Street. And taught them a lesson or two. And the mighty Warrior Queen. 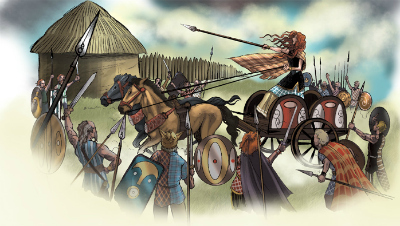 Women had few rights under Roman law, so when the Iceni king died and was succeeded by his widow Boudica (or Boadicea), the Romans did not accept it. Boadica was publicly beaten and her two daughters raped by Roman soldiers. Boadica's response was to raise the biggest army Britain had ever seen, and destroy Roman settlements across Britain, including London. 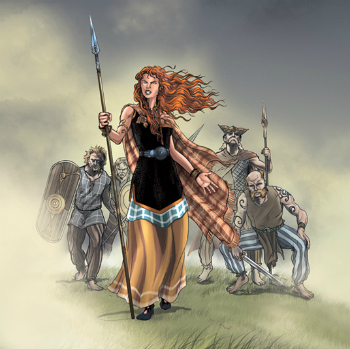 Boudica took poison rather than fall into the hands of the enemy. There is a story that Boudica's body lies where she fell, in the place that is now Platform 10 of Kings Cross Station in London. In fact, this is the reason that Harry Potter's Hogwarts Express leaves from platform nine and three quarters. However, sadly, this is a myth. The Warrior Queen's final battle was actually in modern Warwickshire.